Jypyä Pop (Turku, Finland) on 7 February 2012 in Animal & Insect and Portfolio. Beautiful photo and ...excellent title! @Nigel: You are right. Once again, the emergency determination. To learn the lessons. Nice winter composition. Like its attitude and your perfect title ! @Evelyne Dubos: Thank you Evelyne. @farnaz.m: Thank you. I like them too. They are beauties and strong. @CElliottUK: Thank you. Swan is beautiful bird. Need to stretch to keep warm! Superb timing and beautiful colours. @Adela Fonts: Once again, Adela, you got me in a good mood commentary. Thank you. It's great that you liked the picture. All the best to you. Really streching !!! Graet composition ! super compo de ce cagnes dans cet ensemble glacé sueprbe compo avec la maison en fond. Well, we all have to at some point. @The Mouse: Yes you are right. In the morning, waking up sometimes works in a comfortable feeling, when a little stretching. Yes stretching ! very good timing , nice capture ! Nice capture!! This looks like a place right around where I live. You have inspired me for a photo shoot!! Thank you!! @ajcullen: It's great to hear that the shoulders have ideas kuvistani.Tuo image is about 15 kilometers from Naantali to Turku. Location highly water flows, and very often do not freeze. It has a lot of birds in winter. Bird lovers will bring into that close to the food linuille and that is why it is a good place for bird watching. @Aly: That's the ideal place to Finn's house. It is close to the city and the beach. This house is situated in Naantali, which is a small old town about 15 kilometers from Turku. 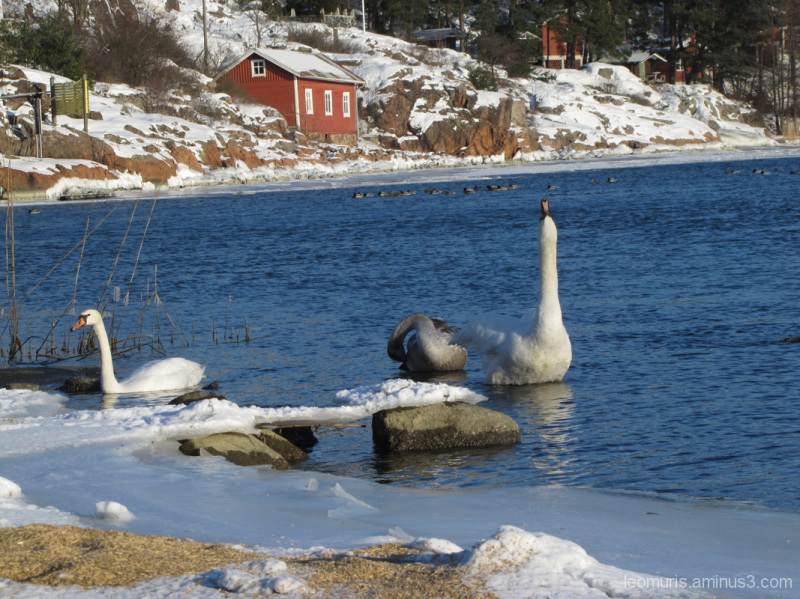 A beautiful winter day and excellent composition with the scenery and swans. Très sympa le titre et bien approprié!! !